Our new Capital Crystal Star award comes with a gorgeous emerald green star which will be a real attention getter in your awards program. 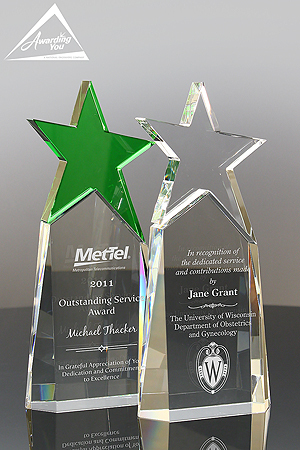 At 9" tall and 4" wide, this award has a great amount of engraving space for your logo and award text. The award also comes with a clear crystal star in case you need an award with two categories for your program. There is also a sapphire blue star option that will debut next month, so let us know if you'd like the blue star as well. Pricing starts at $199 for all 3 colors of the award. For more informaiton on the star, check out the product section of our website.